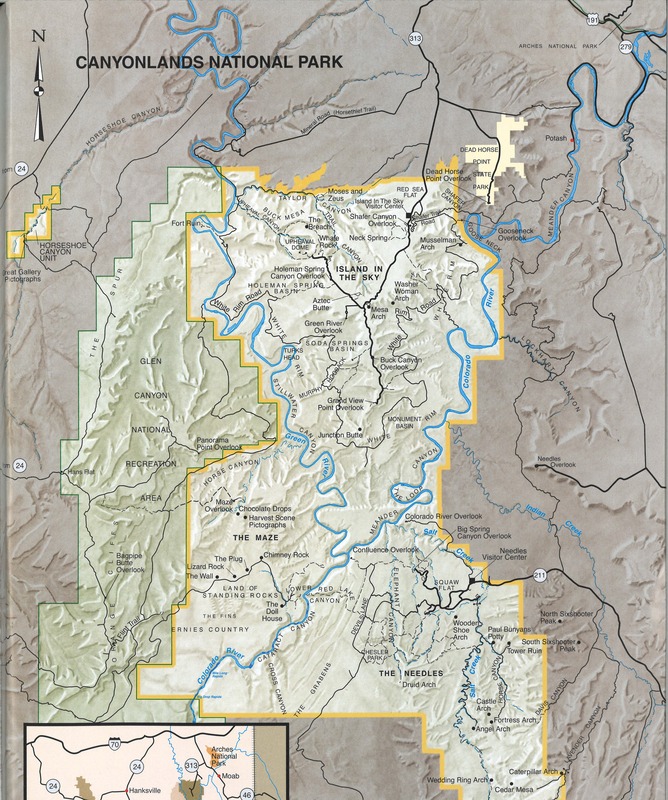 The confluence of the Green and Colorado Rivers divide Canyonlands National Park into three sections: Needles, Island in the Sky, and Maze districts. Different than its neighbor, Arches National Park to the south, Canyonlands is more canyons and mesas, similar to the Grand Canyon. 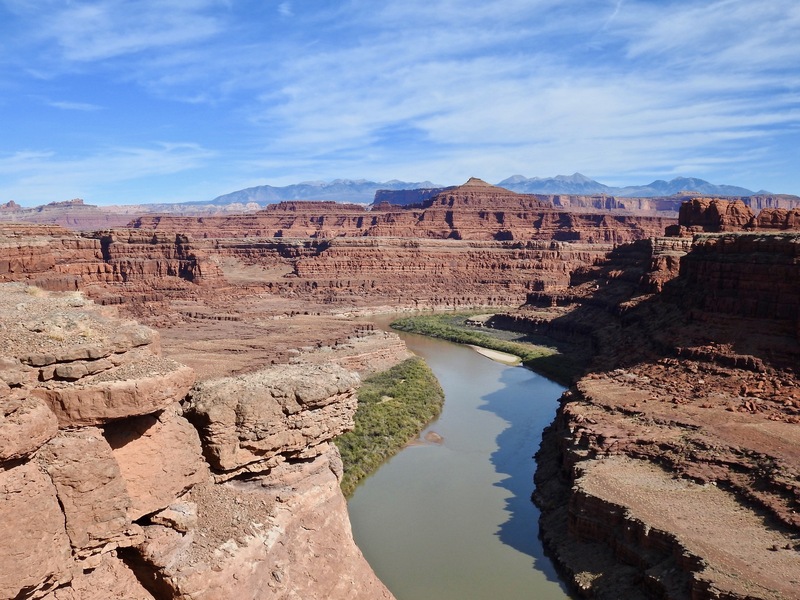 In fact, Canyonlands is often called “Little Grand Canyon.” I’ve been to both and prefer Canyonlands because I can get up-close to the beauty of the area. A combination of water, gravity and time have created this beautiful, natural canyon. The formal name of this overlook is Shafer Canyon, but affectionately called the Thelma and Louise Overlook. 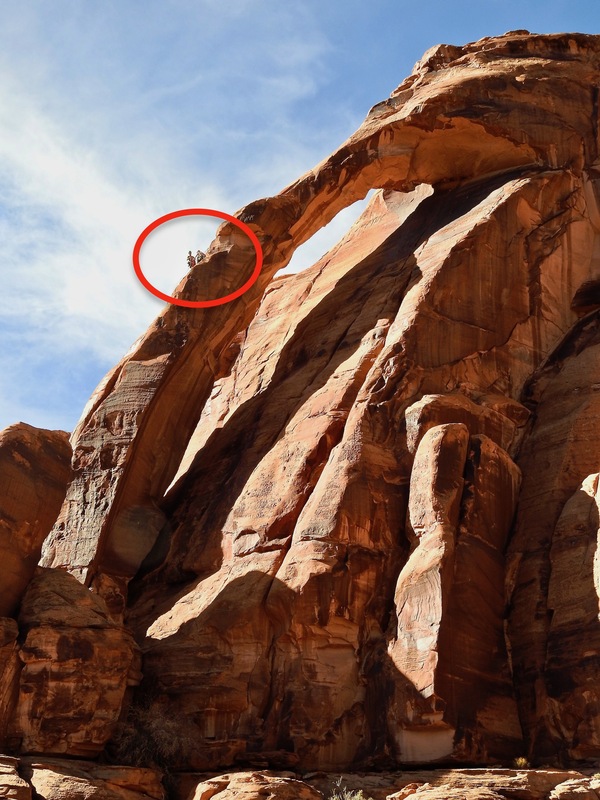 This is where the car with two manikins was sent over the cliff…twice. 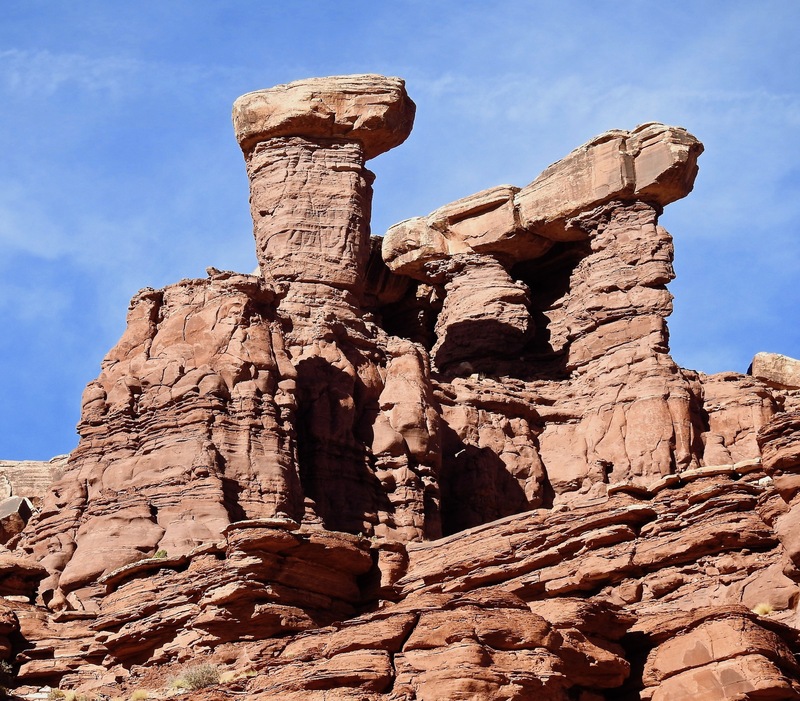 Of the three sections, Island in the Sky is probably the most popular section of Canyonlands. 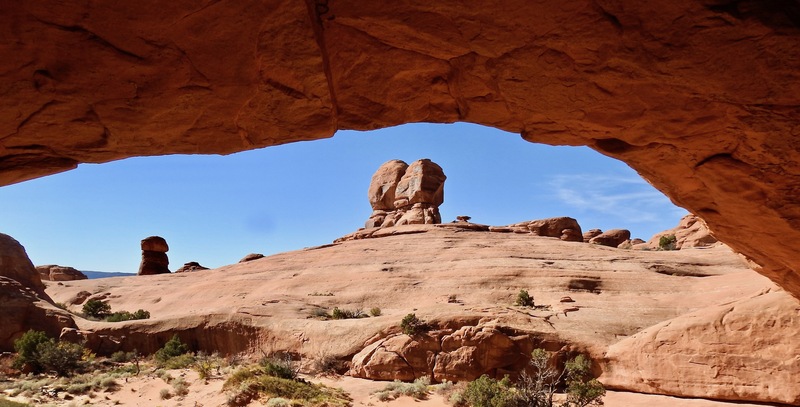 Compared to Arches, Canyonlands is five times larger, 527 square miles. Adrift Adventures in Moab, UT. Looks like two kneeling camels. Or, my favorite, the “teapot” with two rock climbers coming down the handle. Teapot with two rock climbers coming down the handle. 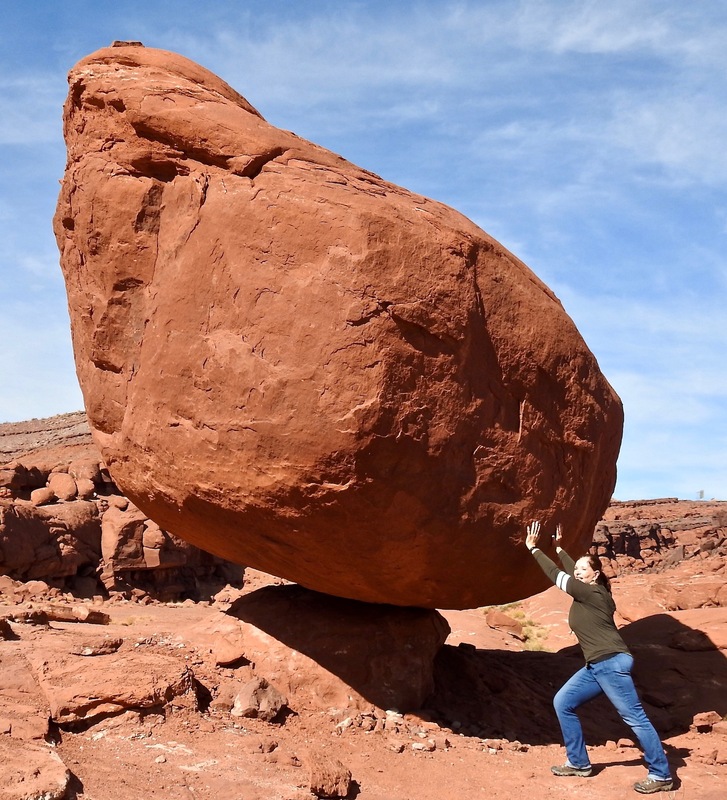 Annie’s strength knows no bounds!!! Being a spectator is great; but, being a participant is even better. Our guide, Heidi, provided great instruction and allayed our fears. Each person in our group had their own backpack, harness, water and helmet. Heidi, our experienced guide, giving us instructions on how to prepare our equipment and be safe on the downward drop. 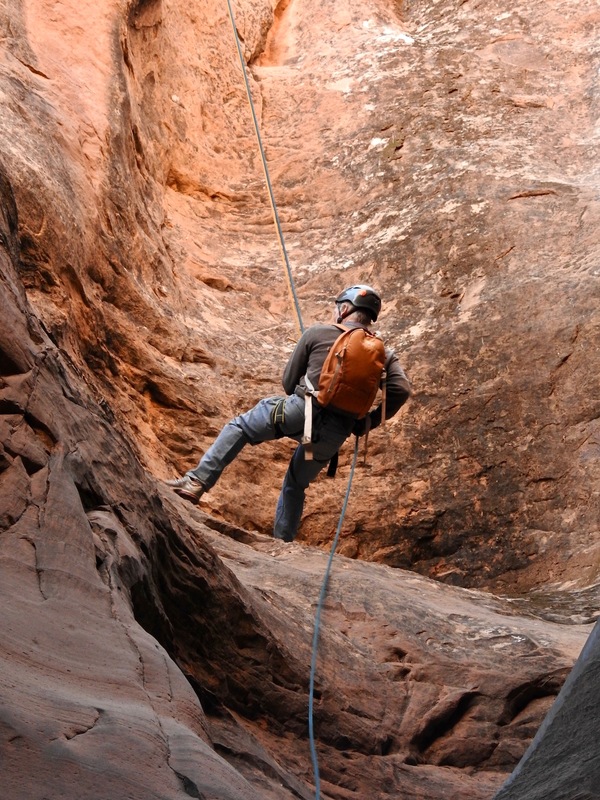 Bruce and I booked a Canyoneering adventure with Moab Adventure Center, called Ephedras Grotto. 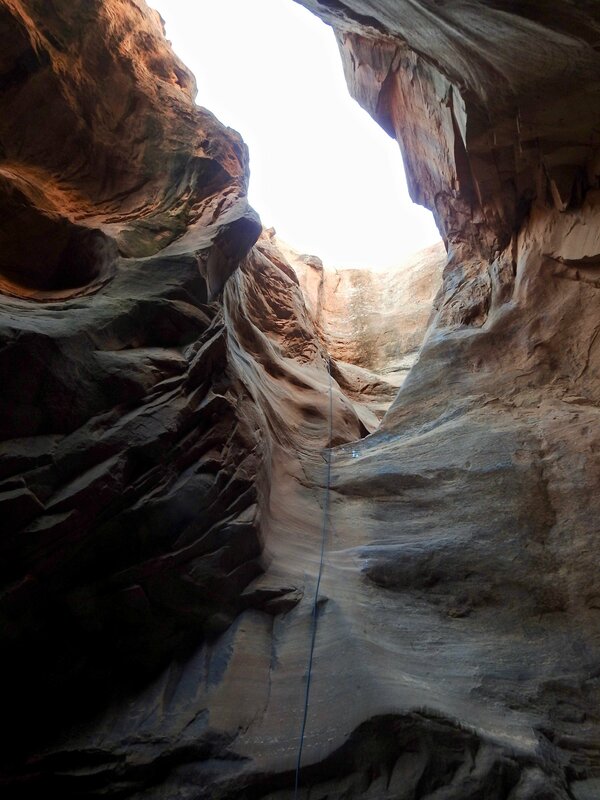 Our first rappel was into a hidden chasm 90 ft. down. Surrounded by rock on all sides, this view is looking up 90 feet from the bottom of our first rappel. 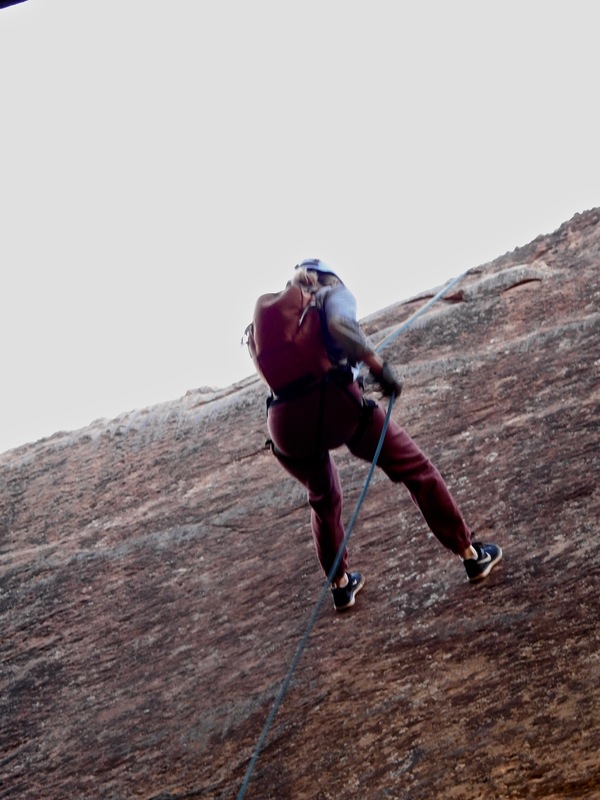 Duncan rappelling into the chasm. Duncan at the first level of the rappel. We exited through a small opening in the rocks. to be greeted by an incredible natural rock bridge….the sixth largest rock bridge in the world. 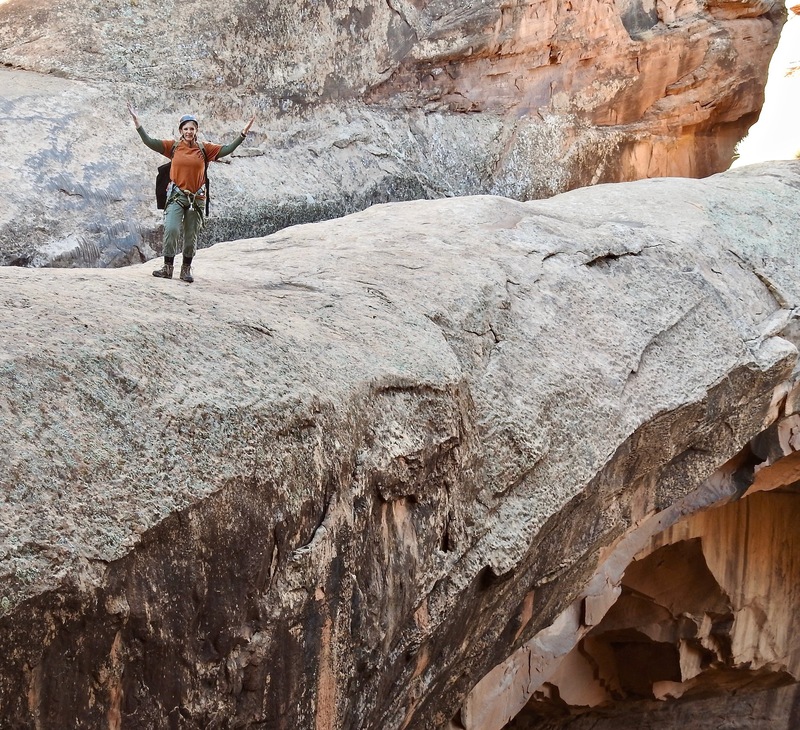 Annie on top of the sixth largest natural bridge in the world. From here we climbed to our second rappel. This was the most difficult of the two, but we all felt successful with the first one and were ready to give this one a try. The cliff had an overhang so once we passed the overhang, we were rappelling in open space. At the end of this 120 ft. drop was a green canyon. 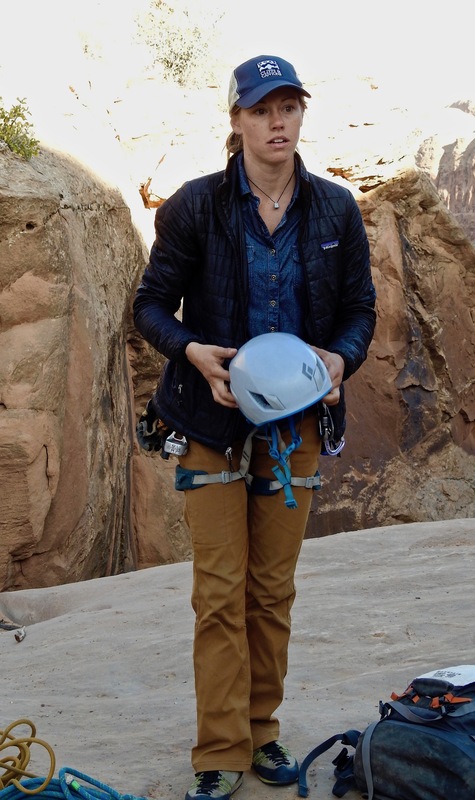 Hilary at the beginning of her rappel. 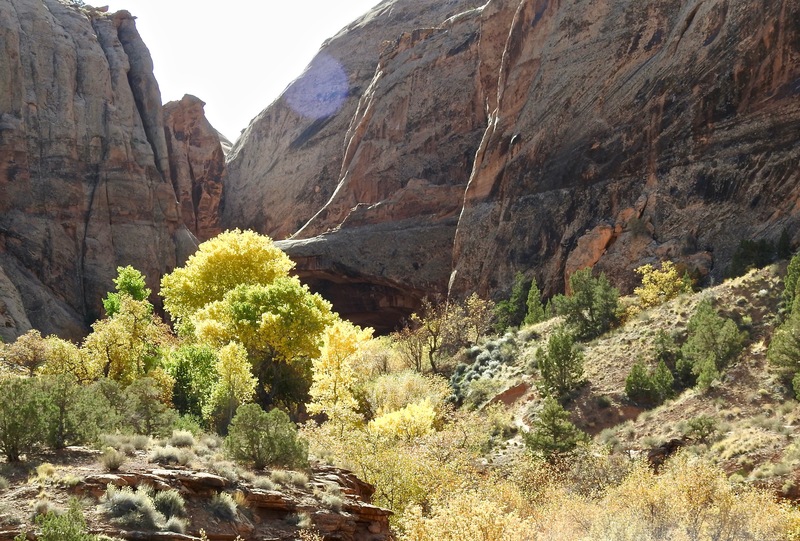 Once everyone was safely at the bottom of the canyon, we began a 2.5 mile hike back to the trail head. 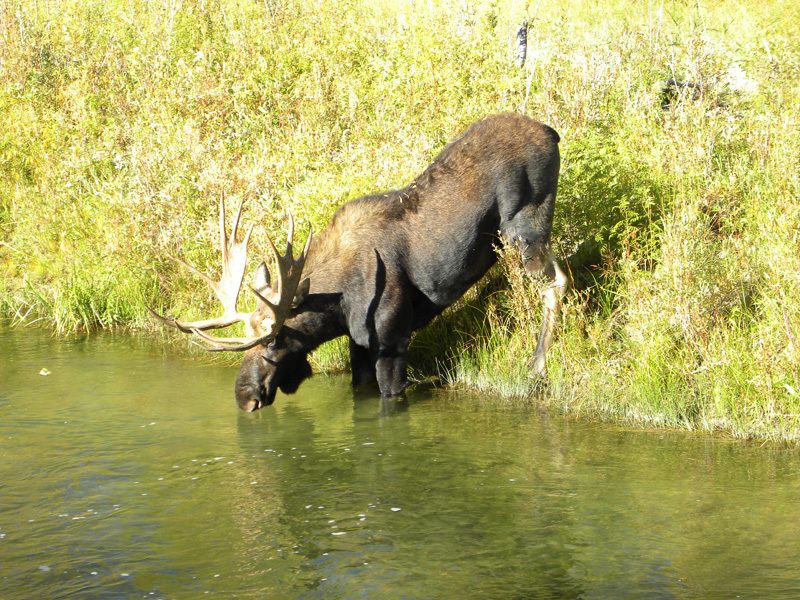 Water, trees and animal life were abundant in this area. Cottonwoods turning their fall colors. 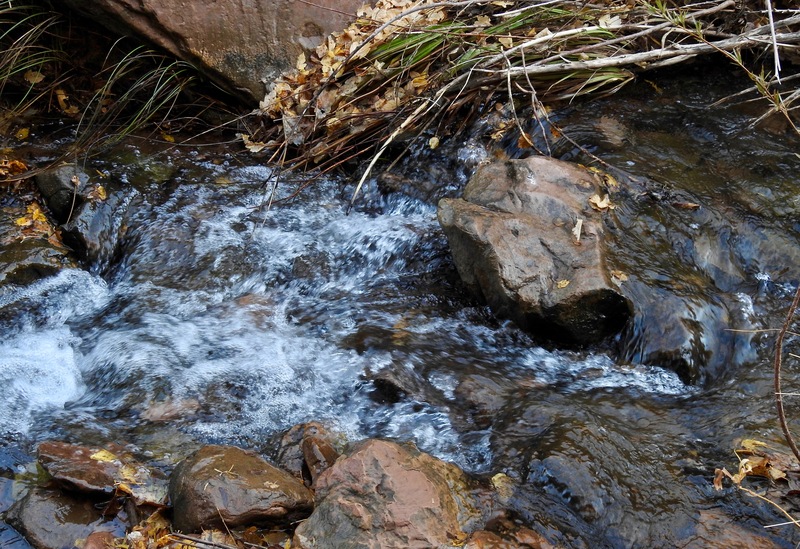 A stream provides water for the animals and vegetation. Beautiful stream runs through the canyon. 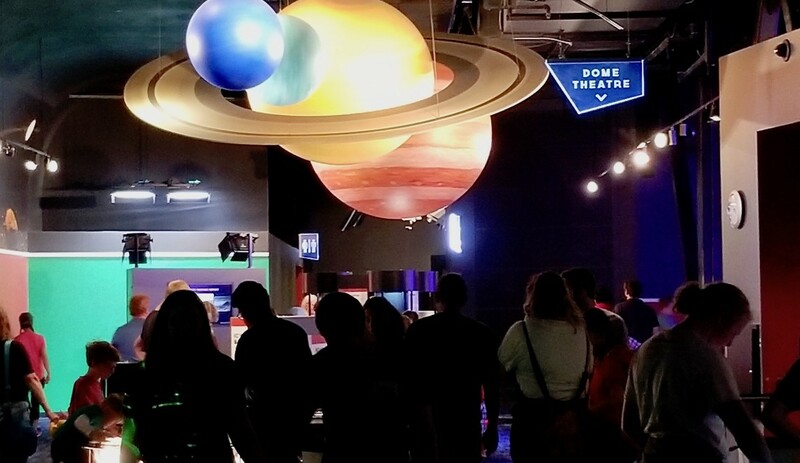 At the end of our five hour tour, we were tried, but proud of our achievement. 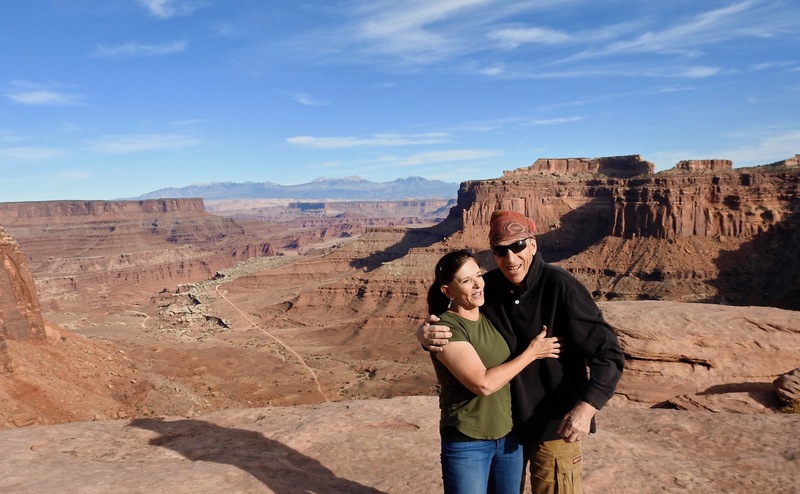 Bruce and Annie in front of Shafer Canyon (Thelma and Louise Overlook. In 2010, Annie Coburn created FAB Senior Travel, a blog for mature and adventurous travelers. Her blog features travel articles from contributors as well as her own travels. Annie has published five travel books targeting the greatest cities on earth: Walk Paris, Walk Beijing, Walk London, Walk NYC, and Ellie’s Grand Adventure. She recently spent seven-months living and traveling in South America.